If you're a regular reader of the Citizen, you're probably aware that I am a big fan of wearing mixed prints. Early blog attempts can be seen HERE, HERE and HERE. 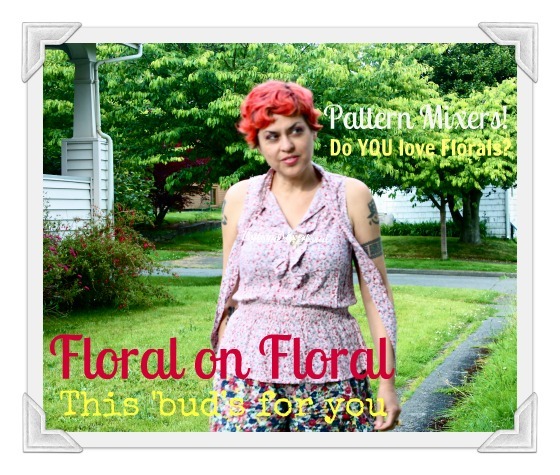 As you can see, there's a common thread in the way I pattern mix, a method to my madness so to speak, and I'm going to share it with you today. One of the easiest prints to mix, in my opinion, are floral patterns. You can do a fair share of mixing floral prints with pretty much everything from polka dots, stripes, leopard, and get this: FLORALS. It's so much fun! A small sampling of my past efforts can be seen HERE and HERE. The "mastery" of mixing is probably in the eye of the beholder: consider the outfit that received the most compliments, was also the one that got me compared to a Christmas tree, and not in a good way. I did a clever twist up of floral on florals in a hard to match hue of pink/orange with creams and browns. I still think it was genius and not just because I was wearing my Iris Apfel inspired sunglasses. You can peek at the Christmas Tree Disaster/Nobel Prize Nominee for Pattern Mixing outfit HERE. Pattern mixing may look complicated but anybody can wear mixed prints when you apply the following six simple tips. Tip #1) Unify by print. Unite the prints by a theme. Start by choosing a single pattern or pair up two prints that make sense together. Take floral on floral for example. Or gingham on gingham. By pairing two or three garments with the same type of print, you can bring some order to all the busy-ness of the patterns. You can then move on and pair differing prints that make sense to be together. For example, try polka dots with stripes. Or floral and stripes. Or Polka dots and, well, anything. Playing with simple geometric patterns is a great way to add interest to your outfits. Just select one or more print to work with, and build your outfit from that. Tip #2) Unify by color. The next thing you'd want to do is unify your outfit by color. To add harmony to your ensemble, you're going to want to have a common color or set of colors in your garments. For example, 3 floral are pleasing together when there are common colors in their patterns, like the pink, cream and green/blue in my outfit shown. Although the florals patterns are different in scale they all are comprised of a combination of pinks, greens and creams, and some blue. In a way, they "match." Even though the blues and the greens don't quite match, the hues of the pinks do, and that helps unify and pull the look together. An Easy Mix: try black and white. A great color combo to start with are the "non-colors:" black and white. You may discover that almost any black and white print work well together when you as long as the garments share a similar drape (see Tip #4). Black and white make a simple yet powerful color scheme; the strong graphic quality of black with white makes it an easy way to get a bold look with very little effort. Tip #3) Play with scale. Pattern mixing looks more dynamic when you play with the scale of the prints. Imagine tiny polka dots with big, fat stripes. Calico is made more exciting when paired with a large "grandma floral" cabbage rose print. Bold diagonal stripes would look wicked if paired with delicate lace print. When you mix up the size of the print, you add interest to your outfit. Tip#4) Pull together by drape. Choose garments that are similar in drape. By drape I mean they share a similar fabric texture, weight and fluidity. Or as the alchemists used to say: Like attracts like. So a crisp starched cotton works well with a canvas twill, silk flows like milk with silk or rayon, and so on. This principle applies universally to dressing. When you wear garments that match each other in drape, your outfit will look pulled together. 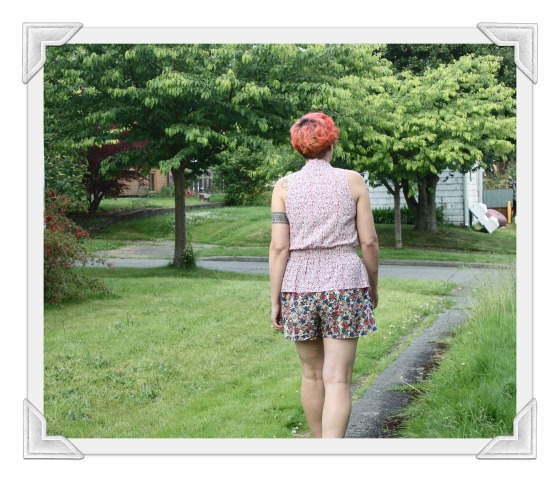 Here, my JACOB rayon top and vintage rayon shorts "go" in spite of being different floral patterns because they both hang in a similarly fluid matter. Tip #5) Experiment, Experiment, Experiment. Experiment and don't be afraid to look foolish. The best combinations come from the most foolhardy (um, I mean playful!) and random pattern mixes, like leopard and floral, or plaid with chevrons. Sometimes the look works, often times not, but be willing to try something new, and you may discover a new pattern to play with. This is not rocket science, folks: we can all do this, so don't be afraid to experiment, and don't be afraid to look foolish. I'm not saying LEAVE the house looking foolish, but most definitely be willing to feel like a clown when matching your baby blue gingham button-down with that Dale of Norway snowflake-motif sweater and your vintage brocade silver hot pants while cavorting in front of your full-length mirror. Tips #6) Have FUN! If you can't apply this last principle, don't even bother getting dressed. Pattern play is just that: P-L-A-Y. It's about having fun with what you wear. So if you're not enjoying the process, go back to your safety-locked formula of a neutral bottom stopped with a solid color top. The following is a list of prints you'll love to mix it up with. Creating a successful mix is part of the fun. You may notice that they are what we call "classic" prints. Classics are items that have a proven track record, they are staples tried and true. I also find that they "play well with others." What prints do YOU like to mix with? 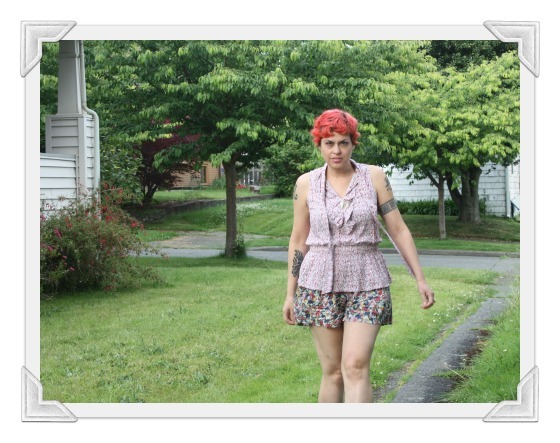 This post is linking up to Visible Monday over at Patti's Not Yet Dead Style. It's simple to join: just visit and post something that makes you feel confident and visible that day. You look so cuuuute! Love the blouse! :) Thanks for the tips, I don't usually mix patterns, because I don't know what really looks good, but you rock it! Yes indeed you are the Queen of the clash!! Long live Bella!! This post must go straight to IFB Link á la mode. Fantastic all round. Love you, my clever hermana. Wonderful post, Bella! You make it look easy : > and it really is, once you dive in. I love florals with stripes these days. I love your tips, sometimes I think when I mix prints I look a hot mess! I love to wear them so these tips will be great. Thank you for these fabulous tips, I love to mix prints and patterns and your scientific method will become my bible!! You look super gorgeous in this outfit and I adore the pink floral theme! Your jacket, the shorts and the blouse are stunning!! It looks so great when you mix prints, and what kind of Christmas trees do people have these days? Your old outfit was gorgeous! Nothing to do with any trees! I find stripes very difficult to wear, but I'll try and remember your guidelines and see if that changes my feelings. Thank you so much for sharing! 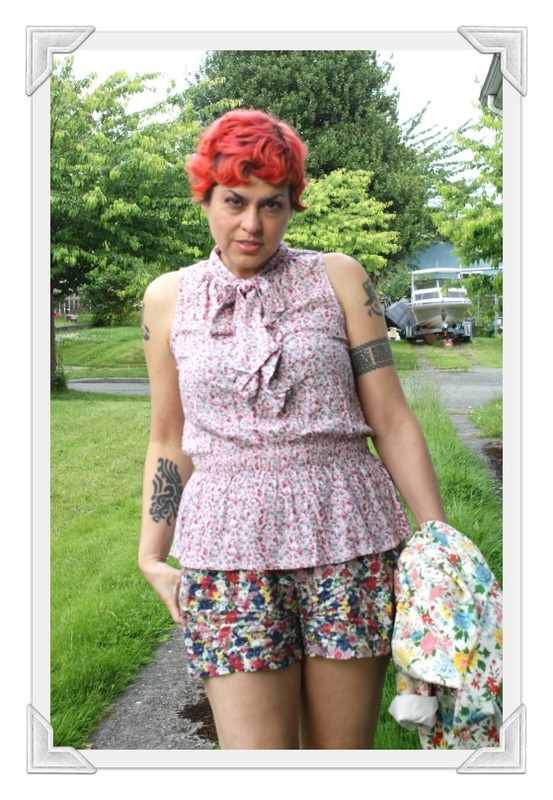 Holy floral pattern mixing, Batman! I love all your tips. Personally, nothing makes choosing an outfit more exciting than pattern mixing. How did I live without it?! You are a true master, your previous post mixing is wow. It's very cool how one person's disaster is another person's triumph. I love that about style! - mixing it up, keeping life interesting. An exhaustive post. Exhausting as well. (And as you said to me earlier, arduous to write). I must now go lie down in the men's sample room here at work where it's all plaids and stripes in dark neutral colors and get, um, BALANCED. I KNEW I shouldn't have eaten that 2nd donut this morning. Your post has left me OVERSTIMULATED! Well, maybe I'll take lunch and go breathe some polluted Irwindale air. That'll relax me! Great work. I still don't think I can explain how I mix it up. Having my clothing in heaps helps! Haha! Wow, these look like such good tips. Perhaps I'll overcome my natural inhibitions and give this a try! And I laughed out loud (literally) at your comments about the Christmas Tree Disaster/Nobel Prize Nominee. I think it looks fantastic! Just goes to show two things: 1) there is no objective "truth" regarding what looks good, and 2) if you want to have a truly original, distinctive style, you must NOT be afraid of bad reviews! 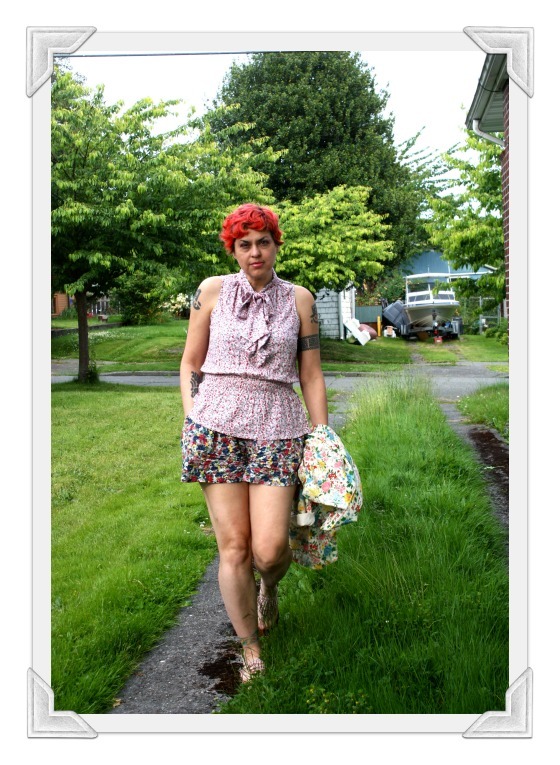 This is a killer post Bella, I don't think I ever pattern mix I never really thought about it until now. I checked out all your examples too you totally are the queen of mixing, I'm getting inspired!!! This is a post to bookmark for frequent consultation. I learned tips that have never come to mind before, so will have to start experimenting. Your floral mix is genius! Found your blog today! Love it so much! You do have a baby face! Lynn, I am so glad you found me! Lovely Judith- you flatter and honor me so much! Krista: I CAN HARDLY WAIT TO MEET YOU!!!! totally adorbs. I love prints on prints, especially florals! Sound advice. I had never thought about the "drape" aspect before. My trick for the occasional pattern-mixing I do is to cross my eyes and try to see a pattern as a single color. Are you going to see Ari when he is in Seattle? dear lady, you're so talented and love to read your wise words! I'm a huge fan of polka dots + stripes in black and white, they're perfect!, and also love any tartan and floral crazy mix, but my favorite advices are Have Fun and Experiment! From tomorrow I'm going to be mixing those patterns up good and proper! Thanks for your advice, I love clashing colour and mixing patterns but perhaps I play it safe too often. You look stunning, love those cute little shorts! 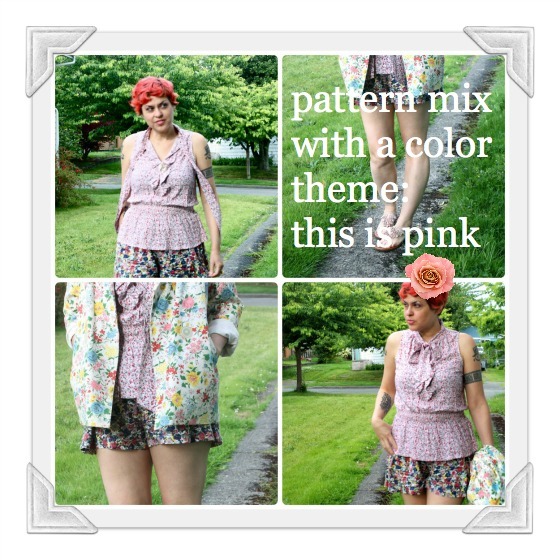 Wow, never thought about the details of pattern mixing - but you are right! I tend to go the colour or single pattern look as it is all fairly new to me. You on the other hand are quite adventurous - definitely an advanced pattern mixer!